Instead of spending time and money producing virus from select vectors in the repository yourself, you can now order ready-to-use virus directly from Addgene! As part of our new Viral Service, we’re distributing lentivirus (with many CRISPR tools included among the preps that are currently available) and adeno associated virus (AAV, primarily chemogenetics tools for now but with optogenetic tools coming soon). The viral preparations undergo rigorous quality control testing at Addgene meaning they come ready made to accelerate your research. Plasmid distribution is booming, but, over the years, many researchers we’ve met with have asked if we can help them share and distribute other reagents. Virus distribution came up time and time again with many researchers lamenting the viral production process while still ordering viral vectors. Virus production can be a frustrating process that requires a large investment of time and resources for labs that don’t have experience with it. We’re reducing this frustration and getting researchers to the experiments they’re interested in faster by producing, titering, and testing viral preps for them. At the same time, we’re developing ourselves as a knowledge base for the processes of viral production and testing so that researchers can use our educational resources and experience to their advantage should they decide to produce virus on their own. "I'm excited that Addgene is now offering virion preparations to the scientific community. Addgene's AAV preparations have worked well in my lab, including in applications where we have delivered them in vivo to the central nervous system. This service will further enable scientists and accelerate research." What Viral Preps Are Avaliable Now? There are a wide variety of tools already available from Addgene as ready-to-use viral preps and we’ll be continually expanding our collection. We’ll provide a brief rundown of what lentiviral and AAV preps are available below, but you can always head over to the Viral Service page to find the full list of what’s available or suggest additional plasmids with the Viral Service Suggestion Form. As some of the most popular lentiviral vectors in the repository are used to produce CRISPR tools, we’re starting the Viral Service with lentiviral preps for the delivery of Cas9 endonuclease, Cas9 nickase, Cas9 activators, Cas9 repressors, select gRNAs, and CRISPR pooled libraries. Whether you’d like to knockout a gene, replace it, modulate its expression, or perform a genome-wide screen, we’ve got viruses to help you out. Of course, lentiviruses are used in experiments other than just those involving CRISPR and so we also have lentivirus for delivering control shRNAs, GFP, and rtTA from the Tet-on system. The first two can serve as controls in a variety of experiments, while rtTA can be used to activate expression of a gene under the control of the tet operator. 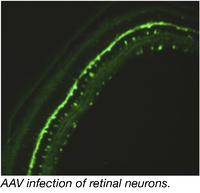 AAVs are the workhorses of both chemo- and optogenetics. We’re therefore beginning our AAV viral services with these tools. A variety of chemogenetic tools from Bryan Roth’s lab are already available allowing you to chemically control neuronal activity while studying your phenotype of interest. Optogenetic tools for similarly controlling neuronal activity with light will be available soon. We’re also distributing AAV preps with particular serotypes that can be used to deliver fluorescent proteins to cells as determined by the serotype. You can use these as controls to determine if your AAVs are getting to the right cells using your particular delivery technique and conditions. Finally, we have retrograde AAV that you can use to map neuronal connections. Expanding the Viral Vector Knowledge Base - You Can Help! We’ve been expanding our viral vector educational resources as well, with both posts on the blog and pages on the Addgene website. 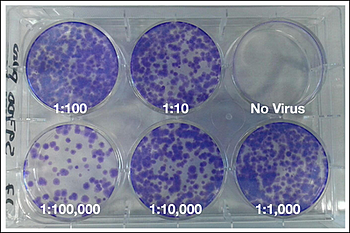 The blog provides tips for working with viruses including advice on how to titer lentiviral preps, troubleshoot viral transductions, and overviews for beginners just starting work with virus. You can find all of our viral vector blog posts here. If you have virus expertise you’d like to contribute to the blog, please email us and we’ll get you writing! On the Addgene website you’ll find our updated viral vector pages as well as expanded virus protocols, information on how we produce and test virus, and quality control data for each of the materials we distribute. Quality control info can be found on each viral prep’s specific material page and includes western blots as well as other expression data. If you have any questions about the Viral Service or any of the materials we distribute, please send an email to help@addgene.org. Your questions help us expand and improve our resources for future users. We’re excited to be distributing new types of materials. At the time of publication we’ve already fulfilled more than 140 orders for virus! We’ll be sure to keep you updated on our progress and would love to hear your thoughts on the service as we continue to develop it. More communication and sharing will only help research advance. Remember: Productivity is infectious!